Two #7Eleven stops in one day! Chef salad package and an Arizona Sweet Tea for lunch. I resisted the hot dogs and taquitos. Stopped this morning for cough drops and kleenex. What? No coffee? Saw Blood Orange Cocoa. Decided to try. Not sure why – it’s 70 dgrees outside. But it was tasty witha hint of orange. 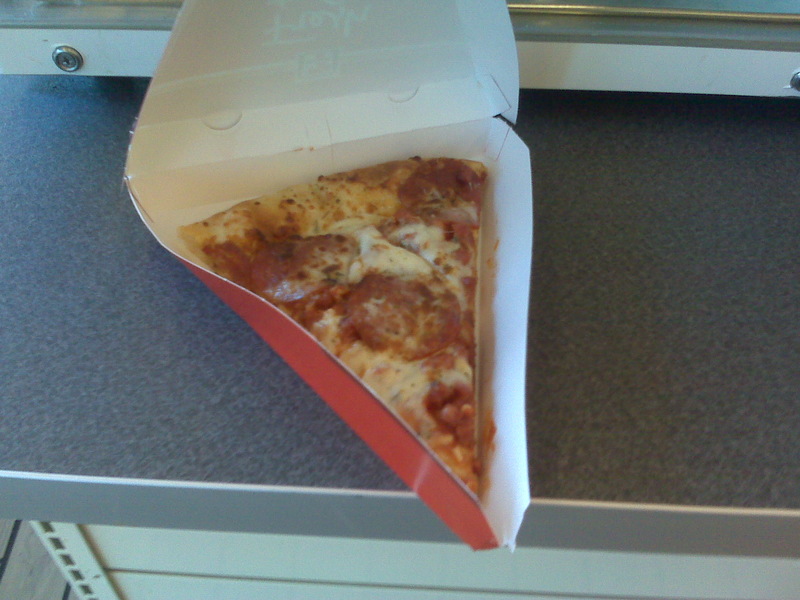 A Pepperoni Slice to Go – From 7-Eleven!? I was hungry – I hadn’t eaten breakfast and I couldn’t wait for lunch. Oooh, here’s a 7-Eleven. I had every intention of grabbing a steak taquito to tide me over. Wait, what’s this? Hot Pizza? In a 7-Eleven? Looks pretty good, too. Well, I have try it – the taquito will have to wait for another day. I grab a slice of pepperoni – hmmm, not too bad. Crust is decent, with an OK flavor – no worse than a pizza from Little Caesars. Late night…a long drive…starving…yeah, a slice of pizza would do the trick. Oh, thank heaven for 7-Eleven. It was warm while driving around and I needed something cool to drink. Or slurp, to be exact. Domo was calling to me – Slurpee. Fuji Frost Fanta Apple Slurpee. 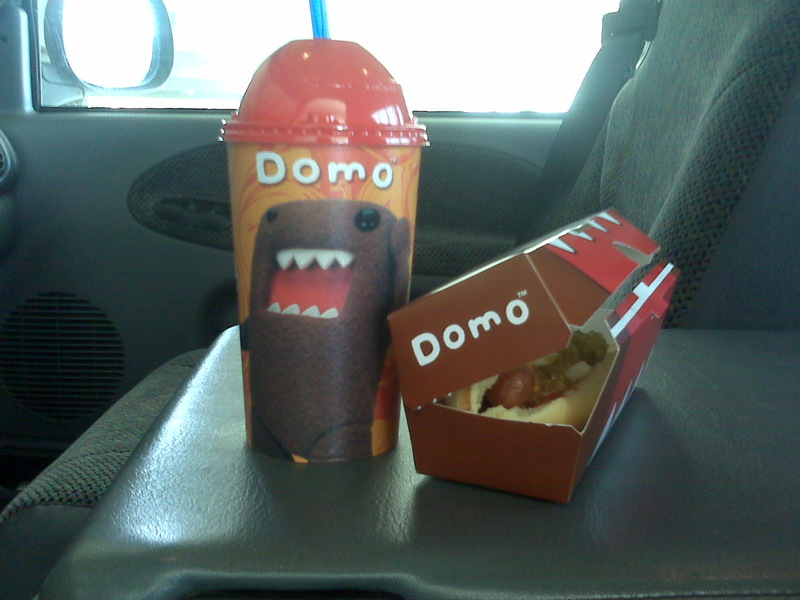 In a special souvenir Domo cup. It’ll taste better that way. Oooh – Domo big bite hot dog only 99 cents. Well, it was lunch time. Fuji Frost Apple – kinda apple-y flavor, but not too sweet like cherry. It made the mustard-relish-onion topped hot dog go down smoothly. That did the trick. Domo was right again. I’m dragging one recent morning – the two cups of coffee before leaving the house didn’t take. Domo was calling me, so I pull into 7-Eleven. 99 cent souvenir cup, filled with hazelnut flavor coffee. 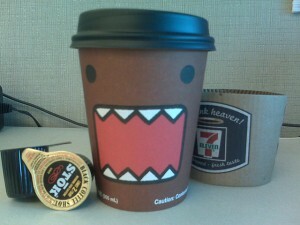 But even Domo’s screaming face with steam coming out of the top doesn’t seem strong enough to do the trick. I need an extra jolt – ooh, in the creamer bin I spot a pile of Stok caffeine shots. Now we’re talking. A couple of those 40mg shots of energy go into Domo, along with a couple more thrown in my pocket, just in case. OK, now I’m set for the day.